Opium poppy field in Afghanistan. Opium poppy cultivation in Afghanistan reached a record-high last year, leading to unprecedented levels of potential heroin on the world market, the United Nations Office on Drugs and Crime (UNODC) said in a new report released on Monday. The report noted opium cultivation increased by 63 per cent; from 201,000 hectares in 2016 to an estimated 328,000 hectares in 2017. 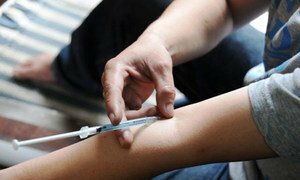 UNODC said that it would be possible to produce between 550 and 900 tons of export-quality heroin from the poppies harvested throughout the country during 2017. The report highlighted that the record level of cultivation creates multiple challenges for the country and its neighbours, as opiate-based illegal drugs make their way across the Afghan border. Poppy production and illicit trafficking of opiates also fuel political instability, and increase funding to terrorist groups in Afghanistan who profit from the trade. The report revealed that the record-high production led to a rapid expansion of the illegal economy in 2017. Being worth between $4.1 billion to $6.6 billion in 2017 - or 20 and 32 per cent of gross domestic product - the value of the opiate-based economy exceeded by far, the value of Afghanistan’s legal exports of goods and services during 2016. Opium poppy production has become so engrained in the livelihood of many Afghans, that it is often the main source of income for not only farmers, but also many local and migrant workers hired as day-labourers on farms. In 2017, opium poppy weeding and harvesting provided the equivalent of up to 354,000 full-time jobs to rural areas. The report concluded that addressing the opiate problem in Afghanistan remains a shared responsibility. Reducing production, requires an international approach that targets the supply chain of opiates at every stage; from source to destination. Organized crime groups in Asia’s Mekong region have intensified the production and trafficking of highly-addictive methamphetamine, extending the illegal trade into countries such as Australia, Japan and New Zealand, senior drug policy leaders warned on Monday at a United Nations-backed regional conference.